Online teaching is still a mystery to many people. How does it work? What are the requirements? Does it pay the bills? Where to start? There are many websites that promise online teachers a quick and effortless start. I’ve found, however, that making yourself independent from the beginning — if harder at first — pays off much more in the long run, both financially and in terms of personal development. Over the last few years I’ve written a number of articles on this blog (bundled in my book “How To Teach Online without Selling Your Soul“) about the journey of teaching online for a living. Today I’d like to talk a bit about the reasons why many online teachers eventually give up altogether or cave in to mainstream online teaching platforms that take a big bite out of their salaries. Most independent online teachers have their own website and domain. The main purpose of an online teacher’s website is to attract new students and transform visitors into clients. It doesn’t matter what subject you’re teaching, whether it’s advanced algebra or Gaelic, your website either works, or it doesn’t. When I talk about design, I’m not referring to color-harmonies, typesetting and visual styles (although that’s all important). 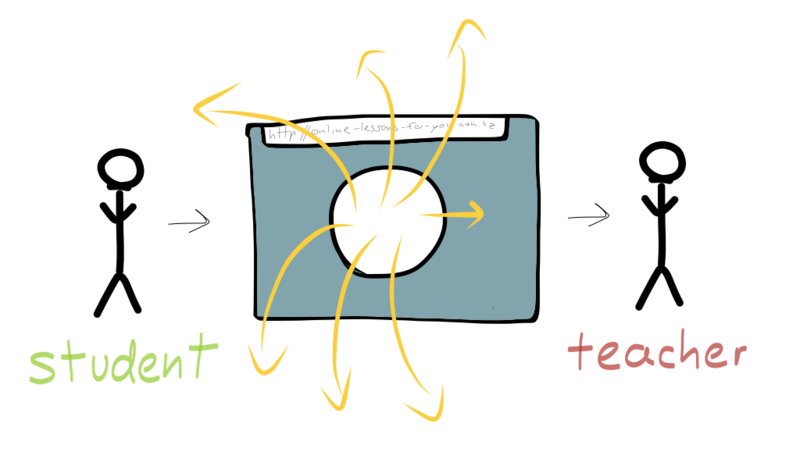 What I mean by design is the mechanics of an online teachers’s website. In that sense, good design is not a matter of taste, it’s a matter of functionality. Thanks to our free online teachers directory I see a lot of online teachers’ websites every day. 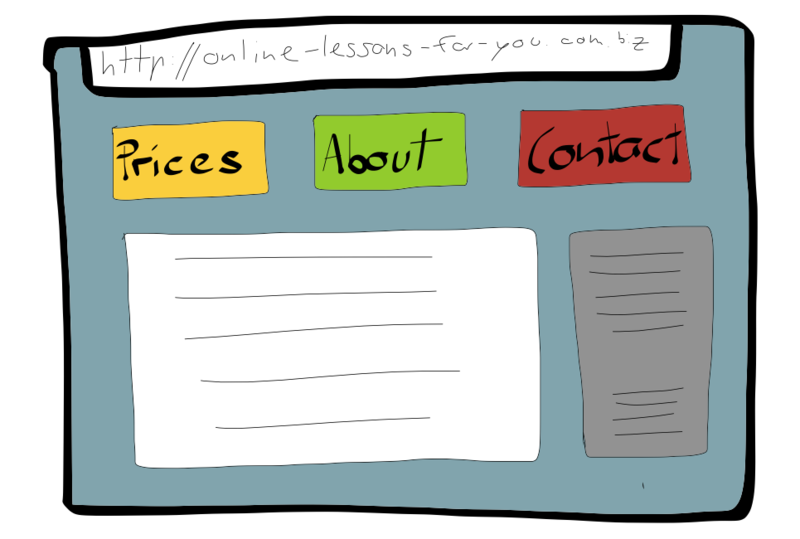 Unfortunately, many websites of online teachers suffer from bad design. In other words, they don’t seem to be doing a good job of turning visitors into clients. It’s very easy these days to create a webpage. Almost too easy, in that it just takes a few clicks to add all kinds of widgets, shmidgets, social media bars, buttons, popups and toolbars until a website becomes completely unusable. Let’s start from the beginning. A website should connect students or clients with the online teacher. Think of the website like a portal. It should bring the student directly to you, the online teacher. This is its sole purpose. Everything else on the website should be subordinated to this primary function. I’m very well aware that an online teacher’s website should showcase the educator’s professional interests, activities, history and many other details around his or her profession, but if you want your website to turn potential visitors into paying clients, all of this information has to be organized in such a way that it doesn’t interfere with the site’s primary function. Let’s start by looking at a general menu or navigation element of a website. As a general rule of thumb: the less options the better. Each option that doesn’t directly contribute to establishing a connection between student and teacher shouldn’t be visible (or at least not on the same organizational hierarchy level). To help you organize this information, put yourself in the shoes of a potential client. If they are actually interested in taking lessons, they will want to know at least three things: a) who’s the teacher? – b) how much does a lesson cost? – c) how can I contact the teacher? Think of a potential path a visitor might follow through the site, for example About -> Pricing -> Contact. 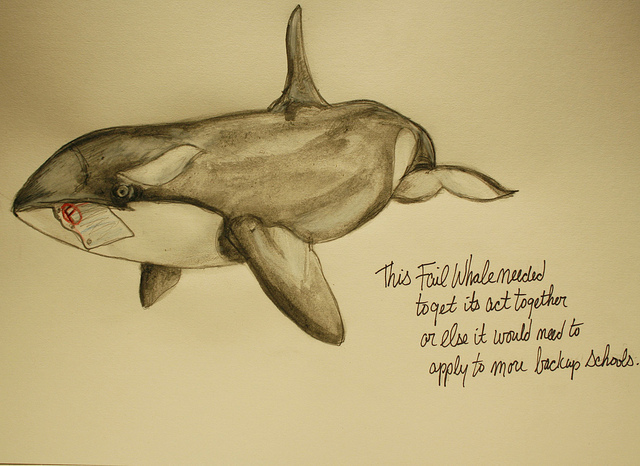 If your website was a funnel, which part would be the top and which the bottom? Where do you want a visitor to end up? By thinking about these questions, it becomes very easy to organize a menu (or any other information) so that it leads to results. 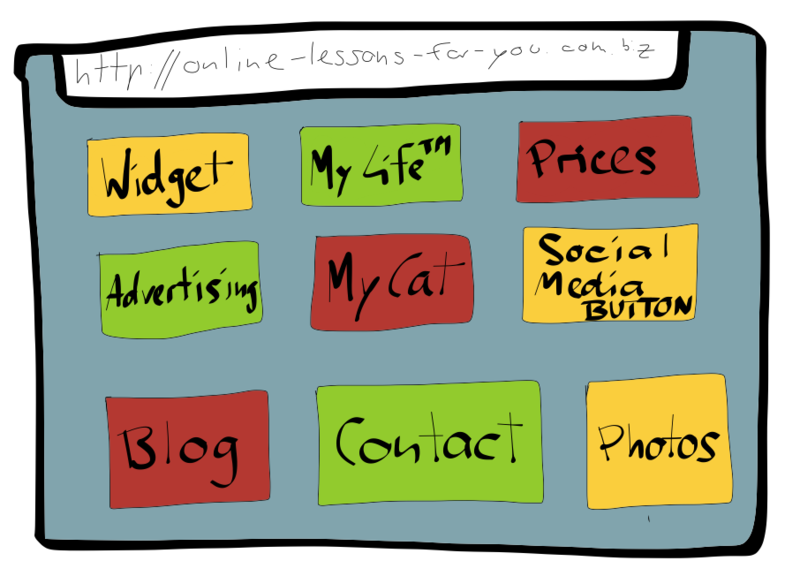 Unfortunately, many online teachers’ websites look like this. The visitor is overloaded with too many options which are not organized along a clear path. Instead of leading a visitor towards a clear goal (such as filling out a contact form for example) prospective clients are scattered or even led away to completely unrelated websites. In general, it doesn’t matter what system you use to build a website. It could be built on Joomla, WordPress or even simple HTML. As long as it’s designed well it will deliver results. Many people are overwhelmed by the technical aspects at the beginning, but the kind of structural thinking I’ve been speaking about has really nothing to do with the technology or platform a website is built on. Everyone talks about Social Media these days, and it has become an integral part of running any kind of online business. However, it does not replace the fact that if people can’t find your website on Google (or other search engines) it’s virtually non-existent. The process of making sure one’s site can be found on Google, Bing, Yahoo, etc. is called search engine optimization or short: SEO. There are a lot of rumors about SEO. Many people think it’s a waste of time, however, as this infographic shows, these opinions are often based on misunderstandings or deceptions. But what does it actually mean to “be found” on Google? It certainly doesn’t mean showing up on Google results page 300! 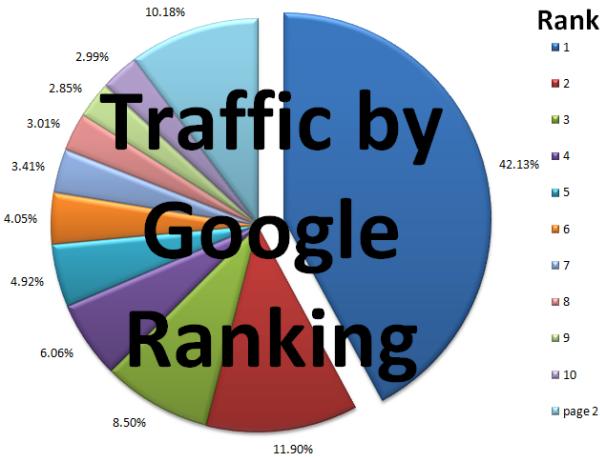 In fact, as you can see in this graphic below, if your page doesn’t show up on the first Google search results page, traffic is radically shrinking. Another great resource for beginners and seasoned search engine optimizers is seobook.com. If you’re running a WordPress blog, also check out this plugin to help you optimize your posts and pages. This is closely related to point two: the more content an online teaching website has, the more it will show up on search engines. For example, I always recommend that online teachers start a blog, because it not only showcases a teacher’s skills and personality, tells visitors that a site is well-maintained — a blog can also radically increase a website’s visibility on Google and other search engines, if done right. For example, if there are only three pages on your website and these do not rank well on Google, writing blog posts that target less competitive keywords can be a great way to gain visibility. Perhaps your website is offering French lessons via Skype, but when people search for “French lessons via Skype” the site only shows up somewhere after page three. What to do? It might be a good idea to find less competitive keywords and keyphrases, and write blog post around them. You might find that it will be much easier to rank higher for specific search phrases such as “French vocabulary for beginners” than your primary keywords. These keywords may not be directly related, but they will still be relevant! Plus, you can try to target new related phrases with each new blogpost. 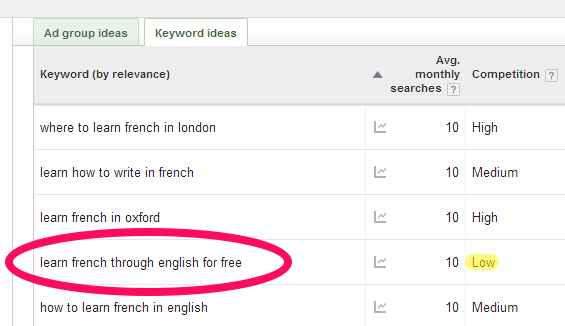 You can find related keywords by using Google’s Keyword Planner. Taking a look at monthly search volume and competition will give you a quick idea if it’s worthwhile pursuing a certain search phrase. Pro-Tip: Look out for so-called “long-tail” keywords. These are very specific search terms which often do not bring a lot of traffic per month but pay off in the long run due to their high relevance. To find these long-tail keywords, start your keyword research from the lowest amount of hits per month and work your way upwards, noting down possible keywords along the way.